I love to make pickles and even though I don’t eat pickle every day I love to store different types of pickles in my pantry. Recently when the pickle making bug caught me I remembered the Chicken Pickle, Ria posted some time back on her blog. I tried it and we really loved it. I have already made several batches of this and it goes very well with rice or chapathi. You can keep this chicken pickle at room temperature, if you avoid adding water while preparing it. Remember to use a clean sterilized dry bottle to store the pickle and always use a dry spoon to take the pickle. Wash, clean and drain chicken pieces. Add salt and pepper powder and let it marinate for 1 hour. Deep fry till the chicken pieces are crisp and brown in colour. Reserve the pieces. In the same oil splutter the mustard seeds. Then add shallots, ginger, garlic and curry leaves and sauté well until golden brown. Lower the flame and add the powders and mix well till the raw smell goes. Add the deep fried chicken pieces to it and mix well. Add vinegar to taste and check for salt and give it a nice boil. Turn off the heat and once the pickle is cooled transfer it to a clean dry bottle and use. 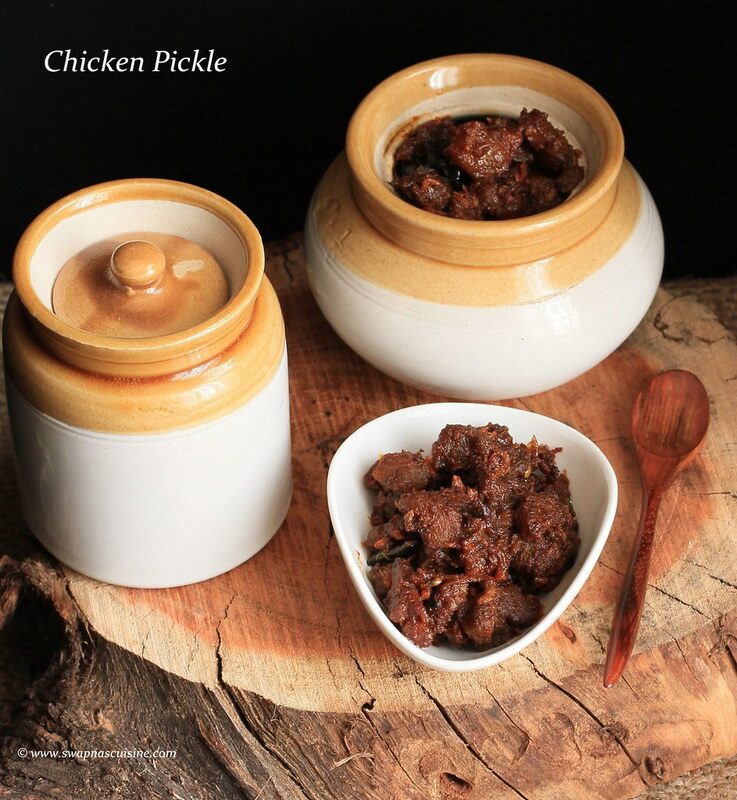 you have a great collection of Recipes Especially I love this Chicken pickle Recipe its too Delicious.Thank you For sharing this recipe to us.